The Red Tailed Hawk is beautiful and majestic. In the United States it is one of the most common raptors used among apprentice falconers. 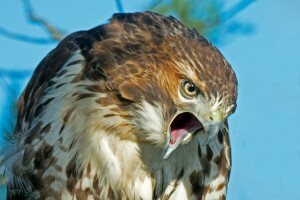 The Red Tailed Hawk has a distinctive call. It is loud, and often described as harsh, hoarse, and rasping. It is a prolonged slurred squeal, which sounds a lot like “keee-ahrrr” or “keeer-r-r-r”. The calls of the males are heard most often during breeding season, though both sexes are most vocal when they are soaring. The call of the baby Red Tailed Hawk sounds more like, “klee-uk” and screams “feed me”. neighborhood, because they can greatly control pest rodent populations. The Red Tailed Hawk does not typically hover like the kestrel, but will usually circle above their prey, then make a steep dive to capture them. This circling and diving behavior is very common among birds within the genus Buteo. 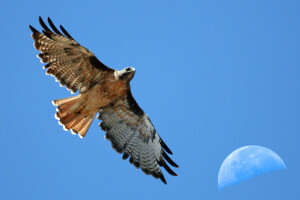 They are not a fast flying species; however, the Red Tailed Hawk will soar so high that they are often difficult to see. In captivity, the Red Tailed Hawk has been known to eat four to five ounces (135gm) a day, during the winter months. winter. They are not truly migratory birds. The Red Tailed Hawk is considered relatively aggressive and will defend its territory zealously, particularly when food sources are scarce, such as during winter months. The Red Tailed Hawk is a hearty bird and is relatively easy to manage. The Red Tailed Hawk is said to be one of the easier raptors to tame in captivity, making his popularity among falconers come as no surprise. They are highly intelligent birds, and will train their falconers as much as their falconers train them! 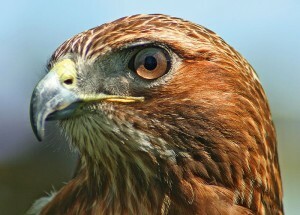 The Red Tailed Hawk is a good bird for an apprentice falconer, but is also flown by many experienced falconers as well. In addition to being popular birds in falconry, these birds are also fairly common in nature centers around the United States. The Red Tailed Hawk is quite large; it is the second largest Buteo (with Ferruginous hawks being the largest). The mature Red Tailed Hawk will weigh between two and four pounds and measure an average of 22 inches in length. They have an impressive wingspan of 56 inches. The female Red Tailed Hawk is larger than the male – sometimes as much as 1/3 times larger. 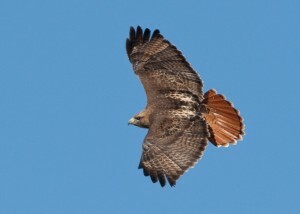 The hallmark of this Hawk is its rounded, broad, dark-red tail. The red tail is only seen in mature Red Tails. The tail of juveniles is brownish in color, with whiter coloring at the base. The juveniles will gain their adult tail plumage after their first molt, at around two years of age. Some individuals may have a black terminal bar on their tails. 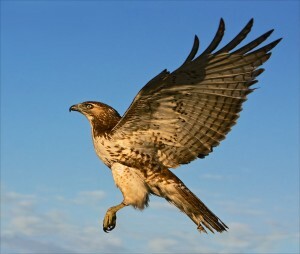 The mature Red Tailed Hawk has reddish-brown plumage covering the top of his body and creamy white plumage on his chest. The rest of his underside is usually light brown or rust colored, and a cinnamon color wash is seen on the chest and neck. A distinct bellyband is also noticeable.The Red Tailed Hawk has a characteristic light colored wrist area on both of its wings. When this hawk is in flight, these light colored areas will sometimes give the effect of headlights. The primary feathers on the wings generally have barred stripes and are tipped with black. The beak of the Red Tailed Hawk is blue-black, and they have a yellow cere. Generally, the Red Tailed Hawks can display a large individual variation in plumage. There are 14 subspecies, which differ in geographical location, markings, and size. Color variation exists even within the different subspecies.The color variations are also referred to as “color morphs.” One of the best visual methods of identifying the Red Tail is the patagial mark (a dark mark present on the leading edge of the wings of all red tails – immatures, adults of all variations except extreme albinos). The Red Tailed Hawk originates in North and Central America, as far north as Canada and as far south as Panama. 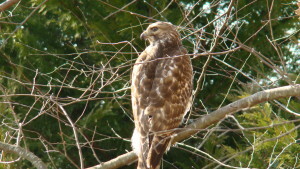 The Red Tailed Hawk is commonly found in open areas, which give it easy access to hunting. They should be near by wooded areas for nesting. Natural savanna is probably the most common habitat for this hawk, though they are also seen in a variety of other areas, including prairie groves, woodlands, plains, farmlands, open country, and mountains, and people in more populated areas have reported seeing them along roadsides. They seem to be a fairly adaptable raptor, seen from desert areas to tundra. They do not, however, seem to like deeply wooded areas. The Red Tailed Hawk is not classified as endangered, and they are fairly common within the United States. 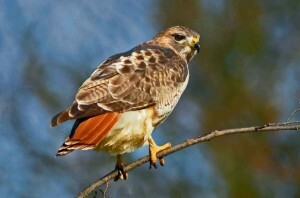 They are the most common of all the buzzard hawks in the United States. These Hawks are most often killed by car accidents and shootings. Keeping captive raptors for falconry is one of the few sports/hobbies that is carefully regulated by the United States Federal government. The same holds true for many other countries as well. If you want to keep a Red Tailed Hawk, it is crucial that you check with your federal government and local state and city governments for the proper licensing and permit information. Housing: If you have the necessary permits and licenses required for keeping the Red Tailed Hawk you are now ready to prepare his housing (in some areas housing needs to be prepared before getting your license, and will be inspected). He should have both an indoor and outdoor facility. The regulations for the facilities will vary from state to state and country to country. The following information is general, and you should check with your government agencies for the exact specifications required in your area. The indoor facility is referred to as a “mew”. It should be plenty large enough to allow the Hawk to extend his wings fully. Eight feet square is a common size for housing a single Red Tailed Hawk. It is important that all wall surfaces be smooth and not abrasive. It should also contain at least one window. It is important that the window be protected from the inside by strong vertical bars. For obvious reasons the spacing between the bars should be smaller than the width of the Red Tailed Hawk’s body. To prevent escaping, make sure all windows and doors can be easily secured. Perches are needed and should be designed specifically for larger hawks. If they are too large, he will not be able to perch comfortably. The outdoor facilities are often called the “weathering areas”, these areas should be covered with wire or netting or roofed, so that the Red Tailed Hawk is not bothered by other animals. In some cases, an uncovered area can be used if each perch is at least six and a half feet high. The area should be large enough so that the tethered Red Tailed Hawk does not injure himself by striking the sides or the roof when flying from a perch. It is important not to allow prolonged exposure to the sun or other elements. Perches in this area, like the mews, need to be of the correct size for Red Tailed Hawks. Some falconers will build combination mew/weathering areas for their Red Tailed Hawk. When caring for Red Rails, like all raptors, it is critical to use perches with rough textures. This is done to prevent the growth of microorganisms on their feet.Some other common equipment seen in falconry are; leashes, bells, tracking devices, swivels, jesses, and a weighing device. It is important that all devices used on your Red Tailed Hawk be the correct size. Red Tailed Hawks reach sexual maturity at approximately three years of age. They will generally form strong pair bonds even outside of mating season; some sources say that they will mate for life. 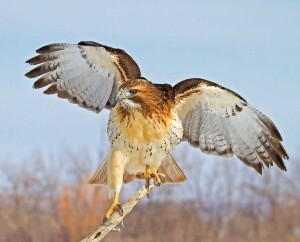 Male Red Tailed Hawks can be seen soaring into the air, sounding off calls during mating season. Both males and females will perform amazing aerial displays during mating season. Breeding season normally begins in March. After mating the female will lay one to four eggs, usually in April or May. The eggs are bluish-white and slightly marbled. Incubation takes approximately one month and is done almost exclusively by the female. The Red Tailed Hawk is a nesting bird, and generally makes large stick nests. The nests will contain cup shaped structures for holding eggs. The nests are commonly found on cliffs or within the forks of large trees. Both males and females work together to build their nests. Babies will typically remain in the nest for 48 days. 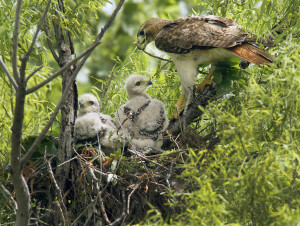 Baby Red Tailed Hawks are slow growing and require much food from their parents. The average lifespan for Red Tails in the wild is 10 to 15 years, though some may live as long as 25 years.